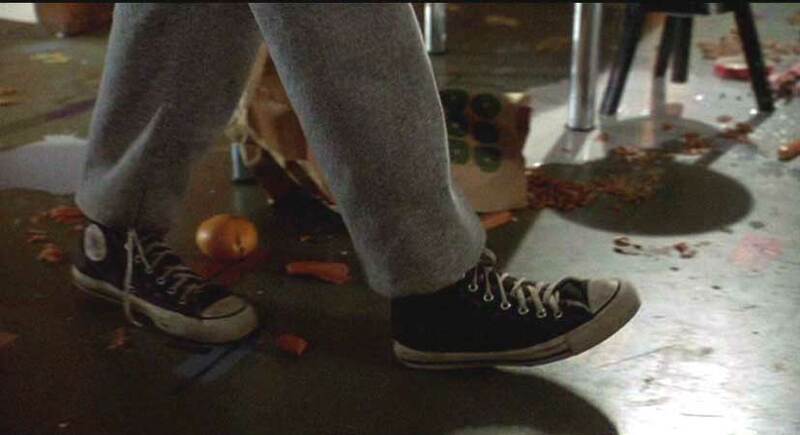 Edward Furlong wears black high top Converse “Chuck Taylor” All Stars in the film. Michael and Kyle are excited about a new CD-ROM game called Brainscan. Brainscan is a combination science fiction and horror film that explores the psyche of a sixteen-year-old teenager deprived of a normal family life who compensates by retreating to a fantasy world of computer games, heavy metal music, comic books, and horror movies. 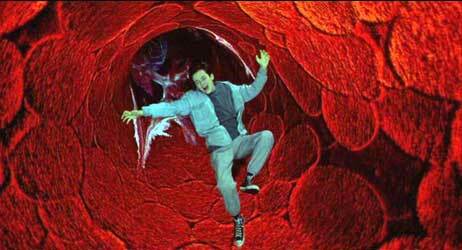 On the outside, Michael Brower (Edward Furlong) has a good life. He lives in a large three story house in an affluent coastal community, has his own attic hangout filled with the latest computer equipment, mega-watt stereo system, and video gear, and has the money and freedom to do what he wants. But Michael was traumatized by the death of his mother and his own severe leg injury in an automobile accident several years earlier. 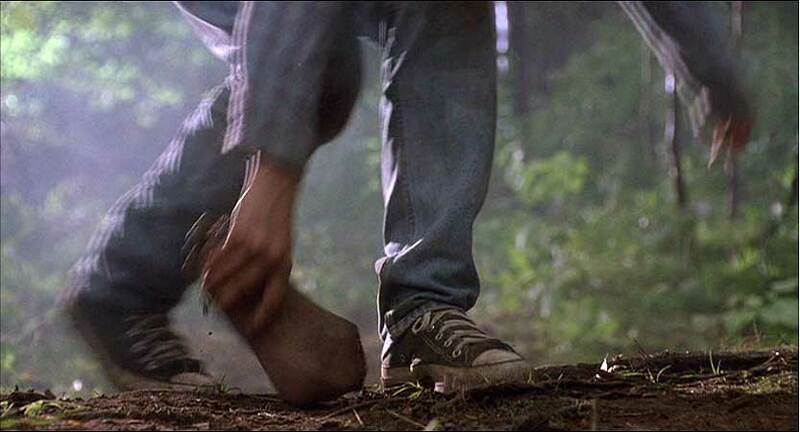 As the opening scene shows, Michael still has nightmares about the accident which has left him with physical scars and a slight limp. Michael’s father responded to the tragedy by immersing himself in his work, and spends long periods of time on the road, leaving Michael to fend for himself. Michael’s main social activities consist of hanging out with his best friend Kyle (Jamie Marsh) and having a limited relationship with his neighbor Kimberly (Amy Hargreaves), whom he interacts with awkwardly. Although Michael has a crush on Kimberly, he is too shy to develop a dating relationship with her, and mostly relates to her in a voyeuristic manner, spying on her with his video camera. At school, Michael is the leader of the Horror Club, a small group of students interested in watching violent horror films, but closely monitored by the disapproving school principal (David Hemblen), who wants to ban the club. The main action of the film gets started when Kyle shows Michael an ad in a magazine for a new computer game called Brainscan. The ad boasts that Brainscan is the most realistic game ever invented, “the ultimate experience in interactive terror”, and that it will “satisfy your sickest fantasies,” but is “not for the squeamish.” Michael dials the toll free number in the ad, and when the voice on the other end answers, it tells a disbelieving Michael that he has been selected to receive a copy of the game, “Death By Design”, and that it is designed to work with his subconscious mind. When the game arrives, Kimberly is having a party at her house. But Kyle has told Michael that Kimberly is starting to go out with a school jock. Rather than confront this or make his true feelings known to her, Michael shuts out the party by closing his shade, turning on some loud music, and booting up the CD-ROM of Brainscan. Michael meets The Trickster, a computer generated character who keeps him playing Brainscan. After the program boots, Michael finds himself looking at the world through the eyes of a thrill-seeking killer. The program’s images have a hypnotic force and he is persuaded to act as a murderer, with instructions to complete the task within an hour or he will lose the game and not be allowed to continue with further games. As he follows the actions of the on-screen but invisible guide, he finds himself breaking into a strange man’s house late at night, grabbing a knife from the kitchen, and then goaded by the voice to “Do it!”, he stabs the man, is told to make sure that he is really dead, and even take along a souvenir of the crime (“a little creativity”) by hacking off a foot from the body. After this, the voice tells Michael that he got what he came for, so “be sure and put it in a safe place.” A little later, Michael wakes up from the hypnotic trance caused by the game. He is shaken up but at the same time thrilled by the depths of fear and horror that he experienced. The next day he tells Kyle that he loved the excitement of the game and wants to play it a few more times before he lets Kyle try it. He then goes over to see Kimberly, but while he is waiting for her in her parents’ living room, a news program comes on the television describing the discovery of a local murder victim killed exactly the same way as in the game. Running back home, Michael makes an even more shocking discovery — the murdered man’s foot frozen in his refrigerator freezer — and now he is afraid that he actually was the murderer. 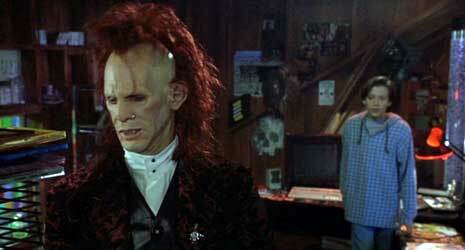 Suddenly a new character enters the story, the Trickster (T. Ryder Smith), a grotesque looking master of ceremonies for the Brainscan game, who materializes out of Michael’s computer monitor through virtually reality. Trickster tells Michael that because he controlled the disk during the game, he must take responsibility for his actions. A very upset Michael yells at the Trickster, saying that none of this makes any sense, that this was supposed to be a game, and that he didn’t kill the man. The Trickster replies that he was there with Michael at the scene, and that it was a classic, primal crime. And now to survive, Michael must continue playing the game, get rid of the evidence, and eliminate any witnesses, except for the Trickster who of course wouldn’t tell. Michael refuses to cooperate, and decides to play the second disk with his video camera going, to prove that he isn’t a killer. When Michael awakes from the second trance, he discovers to his horror that Kyle has now been killed and evidence of Michael’s involvement is now in the freezer. Panicked, Michael telephones Kyle’s house, where the telephone is answered by Detective Hayden (Frank Langella), who is investigating the murders and quickly becomes suspicious of Michael. This forces Michael to become more reliant on the Trickster and soon he is totally entrapped in the Brainscan scenario. How all this works out in the end makes up the balance of the film, as Michael tries to balance his sense of morality and will to survive against continually escalating odds of discovery by the authorities. 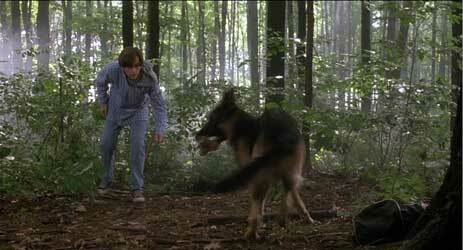 Michael tries to get this German shepherd to return the evidence he is trying to bury. Brainscan is an interesting and engaging film because it takes the violent images so often present in the games, movies, and music popular with teenagers today and uses them to create a moral dilemma for Michael when his violent fantasies start to become reality. Like many of his peers, Michael does not have much of a support system in the outside world, and he is devastated when his inner world becomes a gothic nightmare. Edward Furlong gives a powerful performance as Michael, providing the complexity necessary for his role to work. Sometimes he has the steely-eyed look of a serial killer as he goes through the grisly paces of the Brainscan game or defends his interest in horror movies to his school principal. On the other hand, he shows the vulnerability of a lonely teenager, awkward in social situations with girls which causes him to escape into a world of vicarious sexual desire, embarrassed by his deformity and slight lisp, horrified by what is happening to him, and retreating into his fantasy world of media when unwilling to deal with the real world. 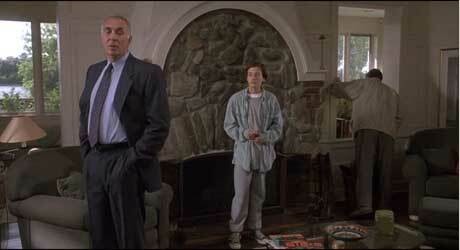 The supporting cast is also excellent, beginning with the darkly comedic performance by T. Ryder Smith as the manipulative Trickster, Frank Langella as the grim detective determined to discover Michael’s role in the murders, and David Hemblen as the morally stern principal opposed to Michael’s Horror Movie Club. Jamie Marsh is perfect as Michael’s spacey, heavy metal-oriented best friend and Amy Hargreaves exudes emotion and sexuality as the attractive girl next door who secretly has a crush on Michael but has difficulty breaking through his protective shell. As is typical in horror movies, there are elements of black comedy like Igor, Michael’s animated computer voice who answers every command with “Yes, master,” the dog who keeps finding Michael when he is trying to hide evidence or elude capture by the police, and much of the demeanor of the Trickster which seems to be a cross between Mick Jagger singing a song about Satan (“Please let me introduce myself”) and Michael Keaton’s manic Beetlejuice. Since the town in Brainscan has some of the look of Twin Peaks, the George Clinton musical score has similar ominous chords, although most of it consists of tracks from metal bands like Dandelion, Stuttering John, Old, Alcohol Funnyear, Pitchshifter, Primus, Mudhoney, Tad, White Zombie, and Wode. Much of Brainscan is a computerized remake of concepts consistently seen in older horror movies, including hypnotic control of someone by a malevolent force and violent dream sequences that turn out to have actually occurred in the real world. Director John Flynn keeps it consistently entertaining with good special effects, tight editing, and believable acting by the cast. There are a few plot twists, surprises, and even some wrestling with your conscience as you ponder the actions of Michael and the Trickster. But face it, do you really watch a film like this for its socially redeeming message or do you enjoy its guilty pleasures like the kids in the Horror Movie Club? Detective Hayden suspects that Michael is involved in the recent murders. Michael is sucked into the Brainscan vortex. 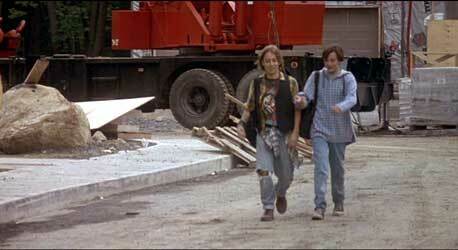 Edward Furlong in his role as Michael wears black high top chucks throughout the film. 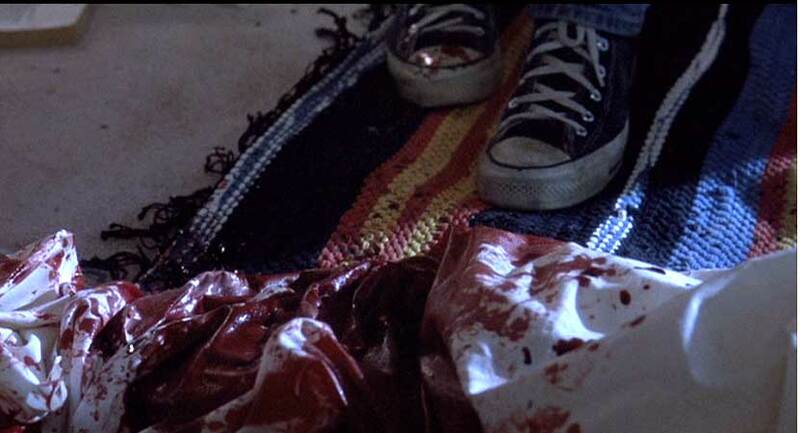 Chucks shots are included in most of the scenes with Furlong, and there are a number of instances where the cinemaphotography shows them in closeup. The closeups are used to show Michael’s presence during scenes of horror or his attempts to cover up incriminating evidence. 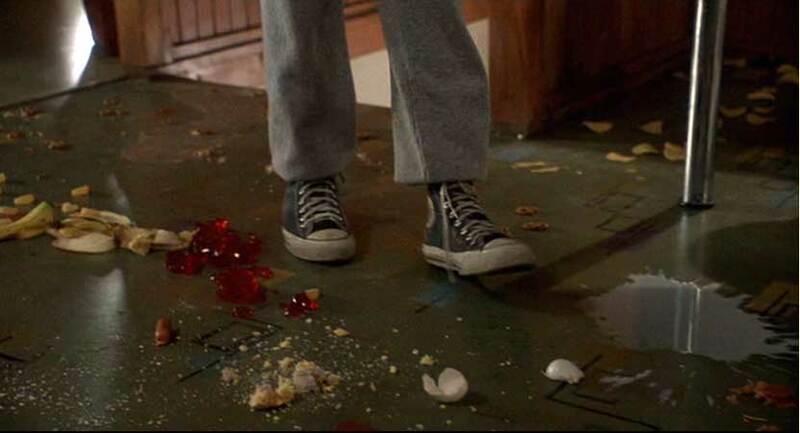 The best closeup scene shows him walking through a mess left in his studio by the Trickster after being questioned by the police. 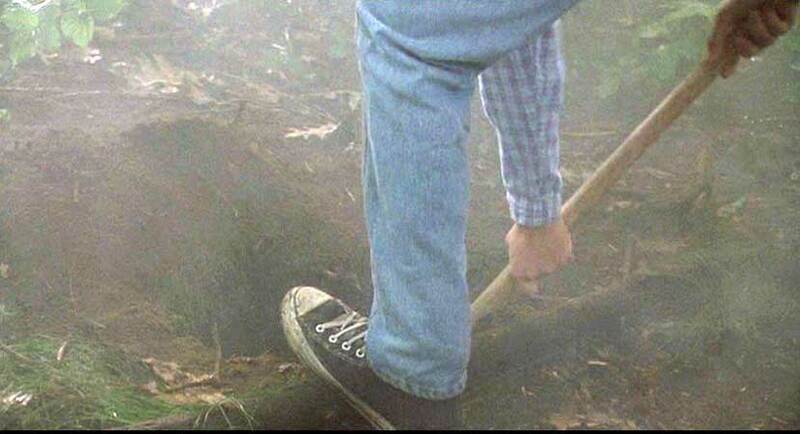 Click on the thumbnails to see these chucks closeups: (1) Michael taps the murdered man in the Brainscan game to see if he is still alive, (2) Michael looks at the bloody mess left by the victim, (3) Digging a hole to bury evidence, (4) Grabbing the foot dropped by the dog, (5-6) Walking through the mess in his house left by the Trickster. Brainscan. (1994) Edward Furlong, Frank Langella, T. Ryder Smith, Amy Hargreaves, Jamie Marsh. Directed by John Flynn.